Hi guys!! How are you doing? 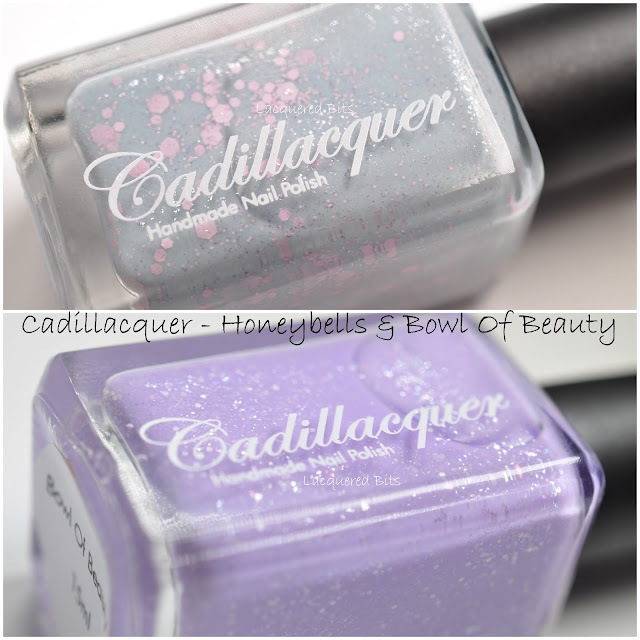 Today I have two beauties from Cadillacquer. And they are Honeybells and Bowl Of Beauty. They are both filled with glitter and micro glitter. This is a beautiful light blue base leaning towards grey filled with pink hex glitter and lilac and white/silver micro flakes, I think. It is beautiful. It didn’t look very attractive in the bottle, but once it was on my nails, I just loved it. You could probably get away with two coats to reach full opacity, but I did three just to be safe and that there wouldn’t be any sheer spots on my nails. And I think the light blue colour popped when I applied the third coat. I had to do a little fishing for the big pink glitter, but it wasn’t hard to get it on the brush. This one was my instant love. I loved it when I saw it in the bottle and I loved it when I put it on my nails. 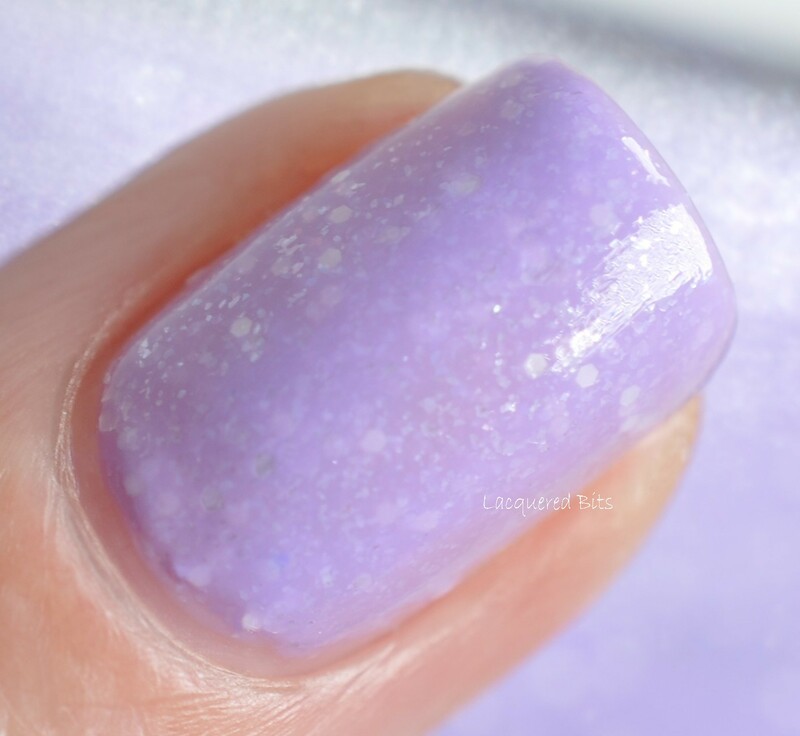 A beautiful lilac with the hint of purple (at least that how it looks on my nails) and filled with white/silver glitter and micro flakes. 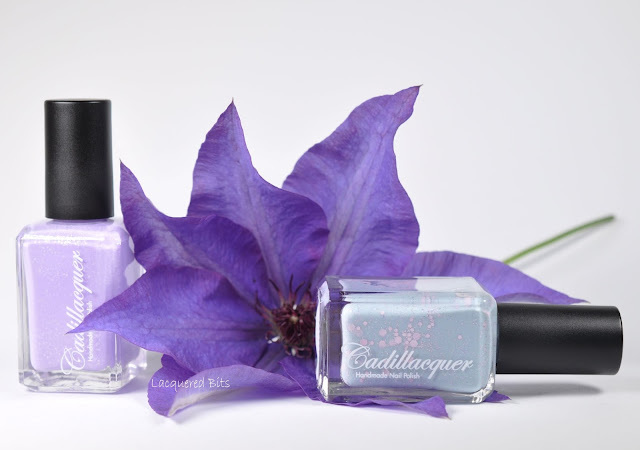 This for me is a perfect lilac polish. There was no fishing for the glitter this time. There was so much glitter that it gave me some issues at the edges. That is the reason the edges are not smooth, but this is just a minor problem, or not a problem at all. I put on three coats and I think this one needed three. Because with two I think it would still be sheer. All in all these two were gorgeous colours that went well with my skin tone. They were both easy to apply and are very wearable shades. What do you think? They both look so lovely! Especially that lilac.